The Lenovo 20KNS04T00 runs on Windows 10 Home Edition. The laptop features a 14 inch,HD LED Backlit Anti-glare Display,1920 x 1080 Pixels and is powered by a Intel Core I5 8th Gen,1.6 GHz with Turbo Boost up to 2.6 GHz processor. To enhance multi-tasking and fast speed, the company has offered a 4 GB RAM. Talking about the storage, the laptop uses a 256GB SSD storage.There is a Bluetooth,Light Weight,Wi-Fi,Fingerprint Sensor and more.The laptop has a 3 cell battery that will give enough battery life to the users. 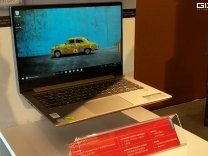 Lenovo has officially launched two new SMB class laptops in India. The Lenovo ThinkPad E480 and the Lenovo ThinkPad E580 will be available in India from the 5th of September 2018 for a starting price of Rs 36,999.